We wore these all the time, year-round…except in the summertime, when we usually went barefoot or used short little boots. Mostly we used these caribou boots for warmth. This pair of woman’s winter boots was made from the leg skins of a caribou. Fur from the backs of the caribou’s legs – which is usually in the best condition on a living animal – was used for the fronts of the boots. Bands of white caribou or reindeer fur encircle the tops, ornamented with stripes of brown beaver or bear fur and tassels of the same material. 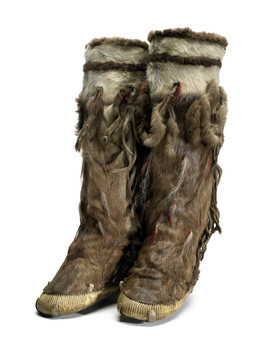 Caribou skin tassels, tufts of red yarn, and white hair decorate the legs. The soles of the boots are bearded seal hide. John Phillip, Sr.: Natriutellrulliniut kina imna ayagpakaami. Nena Rivers: The ones that have those kind of boots, they’re all from inland, not from the coastal side. We don’t have reindeer in our area. Aron Crowell: So your boots would mostly be sealskin. Nena Rivers: Yes. Seal skins and fish skins . . . . Naterkaugguq mana seal skin. Nena Rivers: Yes, maklaugguq [it is bearded seal]. John Phillip, Sr.: Tua-r-llu taqukam fur-aa. Nena Rivers: Elpet-wa nallunrilnguten angutngulriaten bear-amek tanger . . . . Iqua cali mana . . .
John Phillip, Sr.: Tuntuviim tua-r-llu cal’ pikngataaqaa. Nena Rivers: Moose will usually have all this black all the way down, [with] short hair on the leg part . . . . [The strips] are the ones that came from the leg part . . . . They strip them out into pieces to make it fancy. Joan Hamilton: Maybe [they’re made by the] same family? Virginia Minock: These must have been an adult’s. Joan Hamilton: Ataucilria tua tamalkurmi. Nena Rivers: It will be open in the back and cut out. [Then] it will look like this when it’s done. They have to patch them on to shape it up like this and put a piece [on each side] if need be. Joan Hamilton: Pieced together. Yarn-aitellermegni caneng aturlallruat? Virginia Minock: Before they had yarn, they would dye skin. Nena Rivers: Alder wood . . . dyed with red . . . . Maa-i cal’ pituut. Joan Hamilton: Ii-i [yes], in the fall. Aron Crowell: If you’re going to use caribou, what is the best time of year to get the skins to make boots? John Phillip, Sr.: Uksumi . . . Ciissiit pilartut upnerkaryarturaaqan. Joan Hamilton: In the fall they’re still infested. So wintertime is good because they’ve died out. John Phillip, Sr.: November’s good for everything. John Phillip, Sr.: Piluugkiuraqameng sealskin-anek waten waterproof-aliaqameng uqumek piurluku pilaqiit. Nena Rivers : Very dry.